This superlative disc is the first in a series that includes all the vocal music of Robert Schumann for voice and piano. It contains a majority of Lieder from the alter years of the composer’s life. 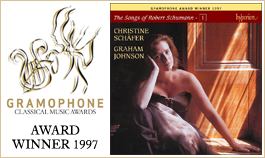 As we have come to expect from Graham Johnson, the CD comes with comprehensive notes on the songs, along with biographical sketches of the many poets set by Schumann. Christine Schäfer’s singing is faultless. This disc is the first in a series which will include all the vocal music of Schumann for voice and piano. It contains a majority of Lieder from the later years of the composer’s life—songs that are generally considered to be problematic. The most important book in any language on Schumann’s solo vocal output, Eric Sams’s The Songs of Robert Schumann (Faber, 1993) is unequivocal in its conclusion that there was a marked deterioration in the quality of Schumann’s invention (which was in any case subject to mood-swings and depression) due to the inexorable encroachment of tertiary syphilis which vitiated the quality of the later songs. It has long been generally felt that these bear little comparison to the masterpieces of earlier years—and of 1840 in particular. There must be something dangerous about being an ageing song composer—perhaps it is a young man’s art form. No one can deny that some of the greatest songs ever written were penned by Franz Schubert as a teenager. Some people would say that Reynaldo Hahn never wrote a greater song than Si mes vers avaient des ailes—and that was composed when he was thirteen! We have the irresistible tunes of Fauré’s early mélodies, the exuberance of the young Debussy, the perfection of Poulenc’s Le Bestiaire (he was eighteen), the inspiration of early Berg and the glories of Benjamin Britten’s Sonnets of Michelangelo written when he was still in his twenties. Old age produces problems. It is true that Schubert was spared it, but in resisting Winterreise on first hearing, even his friends at first thought that his earlier output was superior to it, as well as easier on the ear. Of the composers named above, Reynaldo Hahn’s later cycles (e.g. Feuilles blessées) are never performed, the late song of Fauré (La chanson d’Ève, Le jardin clos, Mirages etc.) are still considered by many to be utterly inscrutable; Debussy’s Villon cycle is judged no match for Ariettes Oubliées; Poulenc’s last cycle La courte paille is a pale shadow of his great Apollinaire and Eluard works; Britten’s fans who grapple dutifully with his last cycle Who are these children? long to return to the Donne or Hardy cycles. So Schumann is not alone in facing a public who sense that he ‘went off’ in his later years. I believe it is too easy to speak of deterioration alone (even if, in the case of this composer, it was an undoubted factor in the development of a late style). There was also on his part a conscious attempt to keep abreast of the times, not to repeat himself. One of the factors was a changing attitude to the piano—still Schumann’s beloved instrument when he wrote his 1840 songs. We can hear how he composed in those days; his great period of writing for solo piano was just behind him, and his love for the instrument per se is everywhere evident. Above the glorious piano writing the voice part flowers, no doubt sung in the first place in the composer’s own voix de compositeur, groan, falsetto and all (which explains why for real singers they are usually too low for the high voices, too high for the low); what is essentially a piano form is embellished with vocal commentary. Of course it was Schumann’s literary perception and genius for tonal analogue which made these works worthy successors to Schubert’s, but they remain nevertheless the creations of a great pianist. In the later years Schumann’s attitude to the piano changed. The instrument seemed to have interested him far less. Now it was an uncomfortable reminder of Clara’s popularity with the public, a renown that far exceeded his own, something which was brought home to him during the disastrous Russian tour of 1844. It was also a symbol of Schumann’s own limits as a composer. He consciously adopted a policy which systematically broadened his range—the symphony was the project for 1841, chamber music for 1842 and so on. Besides, the world of piano-playing had changed so much since his earlier years. Pianism was now embodied by the threatening figure of Liszt, who was a charlatan in the Schumanns’ eyes. Despite the example of Chopin, no serious German artist could hope to join the ranks of the truly great composers by piano-playing (and composing for piano) alone. If we feel there is less exuberance in the later Schumann songs it is partly because the power-house of the 1840 songs, the piano, is less exuberantly employed (except when, as in the Spanish-inspired songs for example, it is required to become a jolly pasticheur). In much of the later music the piano is more of an accompanying instrument with rippling semiquavers, triplets and diffident chords, often mezzo staccato, which suggest mute sympathy from the sidelines. It plays a much more modest, sheerly musical, role; it wears Schumann’s equivalent of the (much later) repentant Abbé Liszt’s clerical robes, and happily stands in for such things as string quartet, harp or zither. We must also not underestimate the influence of the ‘New Music’ on Schumann. In 1840 he seems to have been caught up in a fantasy world where only he and Clara existed or were of any importance. This resulted in astonishing musical spontaneity and lack of self-consciousness. But as a married man he lived in the real world, and Germany was full of rivals with different viewpoints about the future of music; even for a man famous for his lack of envy this must have had a disorientating effect. Of course it was easy enough for the Schumann circle to be shocked and to fulminate against those who had no real, true feeling, no tradition, no respect for the past (Clara was especially vocal on these points). But how easy it must have been to feel that one was being left behind. There seems no question that Schumann felt impelled to look for something new, as a riposte to the stirrings of Liszt, Wagner and their acolytes, and he was as vulnerable as they were to the new world of chromaticism. Schumann seems to have made a decision to move with the times, but in his own way, and almost deliberately in the opposite direction from the others; if they were going to cultivate the dramatic and the flashy, he would forget how he himself had encompassed these qualities, he would forget how close he had felt to Liszt in earlier years (the dedication of the Fantasie, Op 17), and cultivate something special on the opposite side of the spectrum. This individuality lay in the combination of a modified harmonic language fused with eternal emblems of the past—chief among which was the music of Bach which was in its own way even more chromatic than Wagner. Influenced by Mendelssohn, Schumann began an in-depth study of Bach’s work and we hear this time and time again in his later music. Another touchstone of German sanity and depth of feeling (versus what was seen to be the chaos of self-serving Wagnerian claptrap) was folk song, a field as yet unexplored by systematic scholarship, but much appreciated as an idea. In the Op 107 songs recorded on this disc, Schumann’s new-found interest in chromaticism is combined with folk-song style; it is as if the composer is attempting somehow to take into account the new experiments of Liszt and Wagner (Der fliegende Holländer and Tannhäuser had already been published in Dresden, under Schumann’s nose) at the same time as attempting to conserve an ideal of purity in German song. Self-improvement and duty were part of Schumann’s syllabus, and in a strange way the late songs, generally excoriated for musical bungling, are the work of a more professionally schooled musician than the earlier work. Here we can hear a man who understands the voice better than in 1840 as a result of his work and friendship with singers, experience he previously lacked. In sheerly vocal terms the later songs are written with a clearer idea of tessitura and Fach than we find in works like Frauenliebe und -leben and the Eichendorff Liederkreis. The late songs of Schumann have to be heard as reaction against change; but Schumann also liked to think of himself as a liberal and revolutionary (he was certainly no political reactionary) and his response to music was too sensitive and too informed not to try to change at the same time. In a climate of revolution and nascent democracy he wished to be a popular composer, and his interest in folk poetry from all nations emphasises this. His letters from this period, as Sams writes, ‘often mentions his involvement with the times, the originality of his work, its arrangement for dramatic effect, and its relation to the drama of the outside world’. Yet despite this he was hostile to the cult of Wagner which must have seemed depressingly close in Dresden. He must have felt very lonely, not to say beleaguered, with the death of Mendelssohn in 1847 and that of Chopin in 1849. His world was changing too fast. It is no wonder that he greeted the young Brahms almost as a saviour, and that Clara continued to regard him as such. Were the later songs the product of a diseased mind? The only option that the modern performer has is to give the older Schumann the benefit of the doubt. We cannot expect another Dichterliebe or Liederkreis in encountering this music, and yes, we may hear a composer struggling with depression and illness, whose happiest and most productive days have long since passed him by. But he is still Schumann, and still an infinitely dear vessel of musical grace. It is often difficult to say exactly when his ideas are worthwhile or not, to know whether he is attempting to lead us to a magical place as yet undreamed-of, or if he is merely a confused guide taking us down the garden path. Much of the responsibility lies with the performers. In grappling with Schumann’s late style, singers and pianists sometimes attempt to wring deeper meaning from the music, embarrassed that there is not more for them to do, and hoping that the their input will somehow make the music more effective. This displays a lack of trust in our shy and withdrawn host. He may be vague and preoccupied, even ill, but he is not stupid. Like the late songs of Fauré (who also suffered from tinnitus and hearing disorders, and who also withdrew into himself more and more, inhabiting a musical world unlike any other) Schumann’s later songs require the performers to look for a neo-classical approach rather than a deepening of romantic gesture. Fischer-Dieskau talks of ‘a mixture of speech-like song and of melody derived from words … an entirely new medium of vocal fantasy … a new striking language, void of metaphors’. Is this claiming too much for these works? Perhaps, for they are as shy and diffident as their creator. These songs seem to be pulled in two directions—a more chromatic harmonic vocabulary is counterbalanced by a phlegmatic, almost undemonstrative way of using that new language. The essential Schumannian spirit is often there, but it can only shine out (and the comparison with performing Fauré is again relevant) if the performers do not get in the way. The music is fragile, and the work of an ailing man, but it is still more interesting than the strivings of the countless Curschmanns and Gades, Kreutzers, Hillers and Kirchners, whose Lieder once seemed more important than these orphan songs. Eric Sams’s stringent observations about many of the late songs were obviously born of affection, like a stern teacher who cannot bear to see one of his favourite pupils do less than his best. His admiration for Schumann is such that perhaps he felt his passionate advocacy for the truly great songs would be less valid if he was indulgent in special pleading for weaker works. But for all his genius as a commentator, Sams is not a performer, and these works belong to the surprisingly large group of songs from various composers’ later years which depend on sympathetic performance to reveal their secrets. Regular airings of this repertoire, let alone perceptive ones, are not to be heard on the concert platform and actually hearing this music can change the mind of a receptive critic. In the absence of a performing tradition there is a vicious circle of ‘won’t sing’, ‘have never heard’, ‘can’t praise or recommend—therefore won’t sing’ where teacher and academics on one side, and performers on the other, collude in a lock-out of Schumann’s late songs. Society is more indulgent with its errant children than it used to be; Sams wrote his book nearly thirty years ago, and it remains as useful and revealing on Schumann’s genius as ever, particularly on the fascinating world of motifs and tonal analogues. Perhaps Dr Sams would concede that Schumann’s ‘orphans’ might now be given a chance to be let out to play. Who knows, the musical world might adopt them and take some of these problem children to its heart. Great contemporaries, even if they are not close or permanent friends, are often drawn together in the making of songs. One thinks of Fauré and Verlaine, Poulenc and Eluard, Britten and Auden. Yet it is also true that most composers (always excepting Hugo Wolf, whose literary standards were unimpeachable) have been tempted by the whim of the moment to set words that were penned for them by occasional poets, writers of little literary consequence perhaps, but whose friendship meant something to the composer. In this regard Franz Schubert’s choice of poets is sometimes not as much an indication of his literary taste (although this was much more discerning than has generally been believed) as a chronicle of his circle and the amateur literary activity which was the bedrock on which the famed Schubertiads were built. Schubert proved that a sharp eye for the great lyric and an indulgent heart in wishing to honour his friends’ efforts could easily exist side-by-side. He searched the libraries of his friends to dig out the past and accepted the living lyric (when it appeared) as an encapsulation of the present. In this respect Schumann was Schubert’s true successor: of the sixteen poets whose work is featured in this recital, over half were known to Schumann either personally or by correspondence. It is perhaps difficult for those of us who admire and study the Lied as a precious phenomenon of the nineteenth century to realise that one of its main functions for composers like Schubert and Schumann was to keep them au courant with the latest literary thought. It was a modern musical form. Symphonies were time-honoured and operas were commercially necessary, but the Lied was a vibrant diary of the here-and-now. Not subject to strict formal rules, and easily performable at home, song was flexible enough to reflect mercurial changes in thought and feeling. It is little wonder that for a composer like Schumann’s successor Brahms, his songs all but constituted a confessional diary where the literary accomplishment of any poet seems less important to him than the lyric’s effectiveness as commentary on his own moods and preoccupations. Towards the beginning and at the end of this recital there are two poets about whom we know very little and whom Schumann set only once. LILY BERNHARD (Mädchen-Schwermut) was a friend of Clara Schumann. Somehow the poem came to Schumann’s notice in November 1840, and his Haushaltbuch credits the author correctly. We know that Lily met up with the Schumanns once again in Hamburg in 1842, and yet when the song was published posthumously in 1858 the author is ‘unknown’. Perhaps Clara (or the publishers) thought that such a humble name could not stand next to Heine and Kerner on the title page. Nothing is known about CHRISTIAN L’EGRU, poet of Aufträge. It seems likely that hopeful poets posted lyrics to the composer, and that this little poem happened to take the composer’s fancy. Two poets, both little more than enthusiastic amateurs, found slightly more favour with Schumann and were set three times each. JULIUS BUDDEUS (Die Meerfee) was a local Düsseldorf personality who owned a bookshop and art gallery. He also published the famous Songs of a Painter where the poetry of Robert Reinick and his contemporaries, accompanied by exquisite engravings, was issued in two volumes. From the Haushaltbuch we know that Schumann visited Buddeus’s establishment on 17 November 1850 and 15 January 1853. It is easy to imagine that his own literary efforts were brought to Schumann’s notice sometime during their acquaintance. It is likely that the composer bought books from Buddeus, perhaps the Waldlieder (1850) of GUSTAV PFARRIUS (Warnung). Little more is known about him than that he lived and worked in Cologne as a high-school teacher. Schumann received a great many poems by private communication. He set a whole cycle of six songs (Op 89) to the poetry of WIELFRIED VON DER NEUN (of which Röselein, Röselein! is the last). ‘Von der Neun’ (meaning ‘of the Nine Muses’—a pretentious appellation if ever there was one) was the pen name of Wilhelm Schöpf who was a theologian and minister. He moved to Dresden from Leipzig a few months before the Schumanns left that town for Düsseldorf, but there was a meeting on 28 May 1850 (Schumann had already set a text of his) and again in June and August. Schöpf’s volume of poems Herz und Welt only appeared in 1852, so it is certain that the composer had versions of these poems in manuscript. A more important personality was TITUS ULRICH whom Schumann seems not to have met but with whom he corresponded and whose work was sufficiently prized by the composer to read aloud to Brahms in October 1853. Schumann had known Ulrich’s writing since at least 1845, six years before he set the two songs (Herzeleid and Die Fensterscheibe), the composer’s only Ulrich settings, which begin Op 107. The poet was born in Silesia and was educated in Breslau. He then moved to Berlin where his interest in philosophy and politics flourished; he was later an extensive traveller. He was known to be liberal and free-thinking, attributes which would have appealed to Schumann. The verses set here were taken from the Deutscher Musenalmanach for 1851. Schumann set only one poem by WOLFGANG MÜLLER (Im Wald) but here is an almost Schubertian example (cf Josef von Spaun and Der Jüngling und der Tod) where the composer honoured an old friend with just one setting. Müller, known as ‘Müller von Königswinter’ to distinguish him from many others of the same name, was a doctor as well as a poet, art historian, sometime politician and writer on music—an irresistible combination of talents for the hypochondriacal composer who always respectfully referred to him in his diary as ‘Dr Müller’. First mention of him is in the diaries of 1840 (Müller was a fellow contributor to the Neue Zeitschrift für Musik) but after the Schumanns moved to Düsseldorf where Müller had his practice, he became a regular feature of their lives. He was present at a remarkable evening in October 1852 when Wilhelmine Schröder-Devrient sang Frauenliebe und -leben for the Schumanns. At some point Müller seems to have become Schumann’s regular doctor and advocated thermal cures for the composer’s health (which were not effective). He is best remembered as an authority on the history of the Rhineland and wrote extensively on the life and culture of that part of Germany. GOTTFRIED KINKEL (Abendlied) was not known to Schumann personally, but he was a friend of Wolfgang Müller and it is significant that the two men (both set only once by the composer) should stand shoulder to shoulder in the Op 107 songs. Like Müller, Kinkel, an historian by training, had a period in politics and was a short-lived member of the National Assembly in Frankfurt; he was a republican of the left during that brief time in 1848 when there seemed to be hope of a new democratic order in Germany. He took part in the insurrection of Baden, was wounded, taken prisoner and sentenced to life imprisonment. As Abendlied was being composed it seems likely that the composer, sympathetic to the heroes of the abortive revolution, had Kinkel’s fate in mind. The poet escaped from Spandau and fled to the USA, working afterwards in London as a professor of German literature, and from thence to Switzerland where, in a dazzling display of inter-disciplinary non-musical chairs, he became professor of archaeology. The writings of Kinkel (verse epics, political essays and plays) are scarcely remembered today. Schumann took the poem from the Gedichte published in 1850. The remaining eight poets on this disc are all much more important figures in German literature. Three of them are here represented by stray songs which seem to belong to an earlier epoch of Schumann’s composing life. Of these poets, the writer with the greatest personal significance for the Schumanns was FRIEDRICH RÜCKERT whose poetry, and later friendship, played a significant part in Schumann’s song-writing career. Die Blume der Ergebung is the last of the composer’s eighteen Rückert settings. There is some ground for belief that this song was sketched in 1840 which would make it contemporary with the earlier Rückert songs. Melancholie and the two Zigeunerliedchen are settings of translations of EMANUEL GEIBEL and represent something of an 1849 Geibel revival in the composer’s output; the main settings of this poet (Op 30) date from 1840. Rückert and Geibel, both significant poets and linguists with a genius for bringing poetry in other languages to the notice of the German public, will be covered in greater depth in later volumes of this series. Also to be covered in length elsewhere is the poet JUSTINUS KERNER whose poems furnished Schumann not only with texts for five of his earliest Lieder from 1828, but also with twelve important lyrics for his Op 35 Liederkreis. Kerner was one of the first ‘greens’, an amazing and influential personality. Des Sängers Trost is one of the 1840 songs which did not make it into that great cycle. Forever linked to the name of Geibel in the minds of song-lovers is PAUL HEYSE, one of whose two Schumann settings (Die Spinnerin) is included on this disc. Heyse collaborated with Geibel in translating the poems of the Spanisches Liederbuch and later translated on his own the Tuscan and Venetian poems for the Italienisches Liederbuch. Both collections were to be the source of many masterpieces in settings by Wolf, and Schumann was to use some of the Spanish poems in his two Spanish cycles for voices and piano. Heyse studied in Berlin (where Geibel introduced him to Eichendorff) and soon became a famous high-flyer among philologists and writers. An appointment from the King of Bavaria in Munich enabled him to live without financial strain. It is generally conceded that his facility with words led him to a certain superficiality; he wrote many novellas and plays but failed to achieve lasting success. His most enduring achievements lie in the fields of translation and linguistic research. Heyse was awarded the Nobel Prize in 1914. The great German poet EDUARD MÖRIKE emerges here in Schumann’s output as a prophet of later miracles in the history of the Lied. Brahms was later to make a number of important settings of Mörike, and Hugo Wolf fixed the poet’s name as ever immortal in the annals of vocal music with the 53 Mörike Lieder of 1888. This Swabian pastor of Cleversulzbach, a remote Württemberg village, was not suited to the routine of church life. He was a dreamer, and the writing of poetry and the telling of tales seemed more important than preparing the Sunday sermon. Mörike led the quietest of lives in terms of outward appearance, his health undermined by unhappiness and tension in his personal relationships. Yet he created a succession of poetic masterpieces built around an astonishing ability to turn everyday incidents (the creaking of a garden gate for instance) into the highest poetry. His imagination created his own mythology—the magical world of Orplid—and his poems in folk-song style and his fairy tales are a combination of German romanticism and his own Swabian background and humour. In his Mozart auf der Reise nach Prag (1856), Mörike penetrates more sympathetically into Mozart’s personality than do many longer studies by musicologists. Schumann seems to have first come across the poet’s work (published as early as 1832) in 1846 and was enchanted with the Idylle vom Bodensee which he read in 1847. On this disc we hear three of the five Mörike texts set to music by Schumann—Der Gärtner, Das verlassene Mägdlein and Er ist’s, all of which were later set by Hugo Wolf. In his solo songs Schumann set only one poem by AUGUST VON PLATEN. This was one of the composer’s relatively rare excursions into the type of neo-classical poetry (Platen was renowned for his perfection of form and metre) which takes its inspiration from the eighteenth century. Underneath the controlled language burnt many fires of passion and loneliness. Brahms seems to have understood this in his Op 32 settings of this poet, and Schubert’s two Platen settings seem instinctively to reflect both the anguished nature of the poet’s plight (he was a homosexual who dared to ‘come out’ at a time extremely hostile to even discreet expression of such forbidden love) as well as the poet’s classical probity. Platen was an enemy of Schumann’s admired Heine (who insulted the poet on account of his sexuality in Die Bäder von Lukka) and like Rückert was an expert on oriental poetry and the Ghasel form, as well as being a master of the ode and sonnet. Of Schumann’s debt to JOHANN WOLFGANG VON GOETHE there is much to say—as there would be of any nineteenth-century German musician of importance. 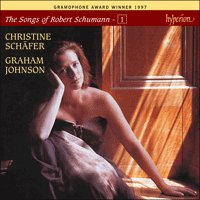 This disc includes the late flowering of Schumann’s obsession with Goethe, the lyrics of Mignon and Philine. Schubert initiated his musical relationship with the poet with a Faust lyric (Gretchen am Spinnrade) and ended with poems of a very different kind from the West-östlicher Divan. Schumann took exactly the opposite course: the first Goethe settings from 1840 are settings from the Divan with its quasi-oriental parodies. A consuming interest in Faust was something that came later, leading Schumann to compose the remarkable Szenen aus Goethes Faust for soloists, chorus and orchestra. Schubert, Schumann and Wolf all tackled poems from Wilhelm Meister, Schumann capping Schubert in the inclusion of Philine’s song in his set, and Wolf capping Schumann by adding a setting of the Spottlied from the novel. On this disc we hear all four of the Mignon lyrics and Philine’s song Singet nicht in Trauertönen. As well as this there is a remarkable setting of the immortal Wanderers Nachtlied lyric, simply known here as Nachtlied. A fuller biography of this great poet in relation to Schumann will appear later in the series. NIKOLAUS LENAU (the abbreviated pen-name of Nikolaus Niembsch von Strehlenau) was born in Hungary, his father an Austrian cavalry officer of ill repute and his mother a Hungarian. His student years were spent in Vienna and it is one of the sadnesses of song history that he had no contact with Schubert. One can well imagine a collaboration between these two if the composer had lived four years longer and found himself able to deal with the poet’s moodiness. Lenau’s poems were published in 1832 which led to a friendship with Uhland and Kerner from Stuttgart—the latter remained an important influence over him, and Kerner’s home was later a haven for Lenau when he was writing his version of Faust (see Lied eines Schmiedes). Manic-depressive by nature, he emigrated to the USA in the hope of finding his ideal of the grandeur and tranquillity of Nature in the wild west, but was revolted by the brutality of the settlers and their injustices. He might have written westerns with this type of experience, but instead Lenau returned to Europe where his work was increasingly appreciated. He settled in Vienna where he conducted an affair with Sophie von Löwenthal who was by far the most important of the many women in his life, and on many occasions his muse. He also had a relationship with Caroline Unger, the mezzo soprano associated with the first performance of Beethoven’s Ninth Symphony whose father was a patron of Schubert. Lenau was a competent violinist and appreciated the merits of this symphony immediately. Nervousness and irritability gave way to more serious derangement and paralysis. In 1844 he issued another volume of poems incorporating corrections to the earlier volume. Plans for marriage in the same year were shelved when the poet developed symptoms of insanity (he was syphilitic) and after being taken to an asylum in Württemberg he was transferred to the asylum of Oberdöbling just outside Vienna. He died six years later. His fate is prophetic of that of Hugo Wolf who fifty-three years later was also to be incarcerated for six years, suffering from the same disease. Although he had never set any of Lenau’s poems before, Schumann seems to have felt particularly linked to this poet, perhaps by his sympathy for the waste that Lenau’s illness represented and the composer’s fear of a similar fate. Certainly the extent of his pains to honour the memory of the poet with his Op 90 were out of the ordinary and were accorded by Schumann to no other distinguished deceased artist of the time, not even Mendelssohn. This recital contains all six of Schumann’s Lenau settings: Lied eines Schmiedes, Meine Rose, Kommen und Scheiden, Die Sennin, Einsamkeit, and Der schwere Abend. The circumstances of the composition of the song Requiem for Lenau which concludes the set are described in the commentary for Op 90.